The House voted Wednesday to speed the introduction of self-driving cars by giving the federal government authority to exempt automakers from safety standards not applicable to the technology, and to permit deployment of up to 100,000 of the vehicles annually over the next several years. The bill was passed by a voice vote. State and local officials have raised concern that it limits their ability to protect the safety of their citizens by giving to the federal government sole authority to regulate the vehicles' design and performance. 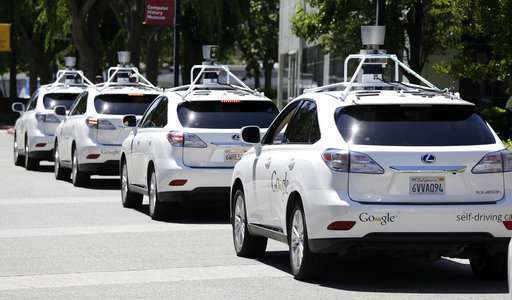 States would still decide whether to permit self-driving cars on their roads. Generally, the federal government regulates the vehicle, while states regulate the driver. Automakers have complained that a patchwork of laws states have passed in recent years would hamper deployment of the vehicles, which they see as the future of the industry. Self-driving cars are forecast to dramatically lower traffic fatalities once they are on roads in significant numbers, among other benefits. Early estimates indicate there were more than 40,000 traffic fatalities last year. The National Highway Traffic Safety Administration says 94 percent of crashes involve human error. Members of the Senate Commerce committee are also working on self-driving car legislation, but a bill hasn't been introduced. If a measure passes the full Senate, the two versions would have to be reconciled before President Donald Trump could sign it into law. The House bill is the product of extensive negotiations between Democrats and Republicans, a rare of example of bipartisan agreement in a Congress riven by political and ideological differences. The measure "gives the auto industry the tools to revolutionize how we're going to get around for generations to come," said Rep. Fred Upton, a Michigan Republican. Rep. Debbie Dingell, a Michigan Democrat, said the bill "is fundamentally an issue of American competitiveness" since foreign automakers are developing self-driving cars as well. The bill addresses "a variety of barriers that otherwise block the ability to safely test and deploy these vehicle technologies," the Alliance of Automobile Manufacturers said in a statement. The bill permits the deployment of up to 25,000 self-driving vehicles in its first year, rising to 100,000 vehicles annually in the third year. But consumer and safety groups say they remain concerned the bill will weaken safety standards and undermine public acceptance of the vehicles if a defect led to crashes and fatalities. "Unfortunately, this legislation takes an unnecessary and unacceptable hands-off approach to hands-free driving," leaders of seven groups wrote lawmakers. Automakers say safety standards requiring things like steering wheels and brake pedals don't make sense. But consumer and safety groups say the bill could permit the government to exempt self-driving vehicles from occupant protection and crashworthiness standards as well. "Exposing motorists to the dangers of crashes without proven and needed protections is a wanton disregard for public health and safety," the groups said. The bill doesn't apply to commercial vehicles, which were carved out after labor unions expressed concern that self-driving trucks would eliminate jobs. "Some consumer groups have raised safety concerns about the bill, and labor leaders fear the technology will cost jobs." But it will save a GREAT MANY LIVES! And car insurance rate will plunge. This clearly illustrates your utter lack of understnding, once again. In this particular case, WRT auto insurance. As an individual owner-operator/driver, your rate is based upon the total number of owner-operator/drivers in your market. Decrease that overall number, et voila! YOUR rate increases! There goes your "entrepreneurial" venture as ride-hail independent contractor. I reckon you'll have to demand a raise from The Heartland Institute as paid troll. You are so stupid and lack any understanding of the simplest things. I will spell it out for you but you still won't understand. In the near future there will not be any human drivers allowed on the road by law. period. You will still pay auto insurance rates but they will be like buying insurance that you don't get killed by a meteorite. Just how "near" is that, derkaderka? And, in your case, they'll probably make you pay insurance for when you forget to breathe. "The near future"? Probably in about 15 years or less. It will take another 20 or so to get all the odd bugs worked out but eventually it's going to happen. I don't believe that human drivers will not be allowed on the road though. They will be a minority but they will still driving some vehicles. It will take another generation or two before it really gets going. There are far too many people in the last 2-3 generations that like driving cars themselves, especially the baby boomers and most of us will still be around for another 10-20 years. When the (well off) lawmakers have their children riding to school in autonomous cars, do you REALLY think they are going to allow HUMAN DRIVERS TO ENDANGER THEIR KIDS? DUI drivers, drugged drivers, sleepy drivers, angry drivers etc.etc. There is picture of times square from the top of a building. There are hundreds of horse drawn vehicles on the roads with only one motor car. 13 years later same building same square there are hundreds of motor vehicles and one horse drawn carriage. Change is happening much faster now days..
And lastly we are on the edge of quantum computers that will change everything. One quantum computer will probably controll all the cars. They expect quantum computer dominance (faster than our fastest super computer now) in just a couple years. I won't disagree with the points you made. All I said was it was going to take time to do it. It's quite possible there will be many areas that will be off limits to human drivers then and rightly so. Highly populated areas especially I would think. I did say I thought it would 15 year or less. It's going to have to start within the next 5 or so though to get it really going by then. Automated cars are going to have to be very available and not priced out of the average person's range. There will have to be less normal car versions available too or people will simply ignore the others. The only big problem I see there is getting the car companies to cooperate with the idea since they all seem to be hp crazy at the moment and auto cars are not going to really need high hp for normal operation as a general rule. I would guess there will still be people that will figure out how to hot rod them though. I don't drive and I'm all for self driving cars but they need to speed it up. There will also be hard to convince people like the 4 wheel types. Especially the ones that have to use them. It would be interesting to see what a self driving car would do after being told to drive through a creek or brushy trail. Probably just set there and beep an error at you. Those folks quite often need a real human controllable vehicle. Self driving is going to be pretty much limited to pavement for a while but people are in regular vehicles are going to have to be able to use the same roads in most areas. There will be many more people that use autonomous vehicles then there will be people that want to drive themselves for whatever reasons. If we let those people on our roads we will each pay for it with higher insurance rates, than if we have ALL autonomous vehicle roads. As far as off road, yes you will see people hauling their 4wd off road vehicles on trailers. just like you see now. I am sure there will be private roads setup for racing to, for a fee/toll. And as far as cost of vehicles etc. Once quantum computers are here they will be able to simulate about anything. Thereby making giant leaps in technology including much better batteries, cheaper better lighter materials for cars etc. Recent articles have highlighted the fact that the autonomous vehicles can be confused by a few stickers placed on stop signs and other traffic signals. The suggestion that they will work perfectly and without accident is simply over-confidence. Consider what happens as an autonomous vehicle ages - sensors become dodgy, software patches increase code bloat, viruses infect the software, the potential for mechanical failure increases. Autonomous vehicles will kill and maim, there's no question of that, and these vehicles will continue to need insurance. autonomous vehicles can be confused by a few stickers placed on stop signs and other traffic signals. And how does that differ from DUIs, Road rage, drugs, sleepy drivers, texting drivers etc? these vehicles will continue to need insurance.